Some people pair cookies with milk, but for the past 30 years I’ve been pairing them with black coffee. I love it so much that I sometimes wonder if cookies would be worth eating without a hot cup of coffee on the side. Okay, not really….but maybe sort of? 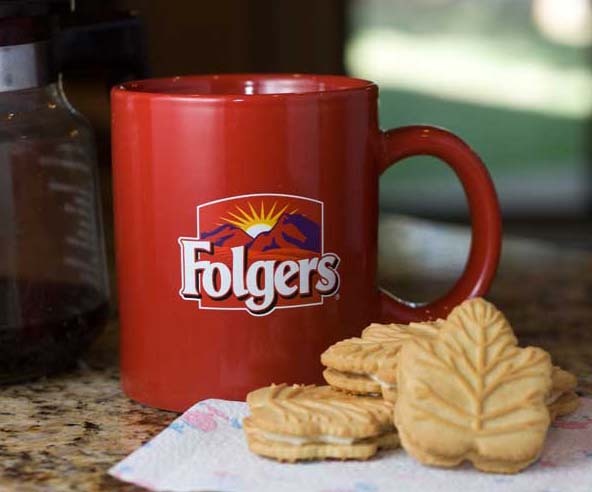 Coffee is pretty much my favorite beverage, which is why I am happy to be partnering with Folgers to promote Folgers Black Silk. Another part of the Black Silk promotion is that I’ll be going to Chicago to hang out at the BlogHer 2013 Folgers Recharge Lounge — a very clever name for a booth where Folgers will be offering samples of their new gourmet flavors (Caramel Drizzle and Mocha Swirl Morning Cafe), Pillsbury donuts, the opportunity to enter numerous giveaways, and where attendees of the conference can recharge their devices on one of 50 outlets. This is kind of a big deal at blogger conferences, as you can imagine. I’m actually a little behind the curb when it comes to maneuvering my technical devices (I just learned how to text last year), and will hopefully pick up some new skills. I’m also going to be updating my Cookie Madness Facebook page with photos of Chicago BlogHer 2013 and Folgers happenings. Maybe I’ll even include a few non-Folgers photos from our the city. Fuzz and I are looking forward to eating lots of awesome Greek food and seeing some good Chicago style improv. — One set of bold personal care travel accessories. Notice how everything says “bold” in front of it? That’s because Black Silk has been described as “bold and smooth”. So given that, “bold” is the theme of this giveaway. For a chance at winning the Folgers gift pack, leave me a comment telling me either what makes you bold or the boldest thing you ever did. For example, my family thinks the boldest thing I ever did was sky dive, but I’m not so sure about that. Bold could me something adventurous, but it could also describe a situation that involved stepping out of your comfort zone for a moment. Let me know in the comments! I will pick the winner on July 24. If you don’t win this giveaway, make sure to stop by the Folgers Facebook page (don’t worry, I’ll remind you) starting July 25 to get free samples of Folgers Black Silk, Folgers Fresh Break Black Silk or Folgers Gourmet Selections Black Silk K-Cup Packets. Good luck! Giveaway now closed. Congratulations to Kim at Kim’s Cooking Frenzy. The boldest thing I ever did was to climb half dome! I tried to stop someone from getting (more) beaten up. I just kept telling myself: they won’t hit a girl. . . In a group oc 10 people I was the only one who did anything. I’d say the boldest thing I’ve ever done is move to Japan after college. Not sure what I was thinking then but it’s been a pretty great adventure! Moving out of my homestate totally alone! I chased down a pickpocket who stole my friends purse with her eyeglasses inside! That was bold! the boldest thing i’ve ever done was travel abroad throughout europe alone! Why didn’t I realized BlogHer was in Chicago?! Boldest thing I’ve done lately? Gutted 2/3 of my house for a remodel. Ugh. The boldest thing I’ve done was speaking in front of a huge crowd! I am not a public speaker, so it was both terrifying and gratifying at the same time. I’m a fairly un-bold person so riding the rides at Disneyworld was pretty bold for me! Especially any of the roller coasters! the boldest thing I’ve done is finally quit my job after being unhappy for a while. sailing for three months as the lone female passenger around southeast asia aboard a cargo ship. Alcohol. Alcohol makes me bold. Moving to a new town, in a new part of the country, after graduation school, having only once visited for my interview and not knowing another soul. I love bold coffee but am not a very bold person. I did follow my high school boyfriend to college 1000 miles away from home. Married now! The boldest thing I ever did was leave my job after 33 years of full time work. The boldest thing I’ve ever done was to backpack through Europe for 3 months with little money and almost no plans. I would do it again in a minute if I had the time and money. After years in the accounting field I went to school at night to become a travel agent. A year later I quit my job and became a travel agent. It was great fun for 5 years. Business got slow so I went back to accounting. I guess I don’t do to many bold things. The boldest thing I think I’ve done is train for and run a half marathon after basically being a couch potato for years! The boldest thing I ever did was to buy a huge boat as a single gal… took lessons and crusied the Mississippi River for a summer. My boldest move was taking tap dancing in my 50’s and then performing before a few hundred people. The boldest thing I have ever done, was meeting, my now husband, in Feb 1985 and marrying him in July 1985. We just celebrated our 28th wedding anniversary. Guess it was love at first site. The boldest thing I have done is have faith in God to lead my life to new areas. I quit my job with health insurance benefits to be a stay-at-home mom and my husband’s place of employment did not offer health insurance. I don’t know if that was bold or stupid! i returned a new car after the dealership tried to increase the price/payment plan originally agreed upon 2 days after the contract was signed. because there was no down payment or trade in, i was able to just drop off the car and walk away. the bold part – i bought the car out of town and wasn’t able to get back to the dealership for 2 weeks. i don’t think the salesman believed i would actually return it after all that time, but i did! The boldest thing I’ve done is negotiate for more money on a job offer. I was just out of college so I didn’t have experience in negotiating, but it worked! My adventurous spirit makes me bold. One of the boldest things I’ve done is I took time off from college so I could go to London and meet up with some of my friends for the week. Not really bold – but a bit ‘uncertain-scary’: Living/working in Greece in the early ’60’s — my 3 children were all born there. At that time, very very few of the nurses, hospital help spoke English! My doctor did (he’d gone to school in NYC and Paris) …. but during the day — it was sometimes difficult to communicate! It sure is fun reading the “bold” things folks have done. The “bold” thing I do is go to work every day… I work in a maximum security all male penitentiary (I can’t wait to retire). The boldest thing I ever did was move to New York! Boldest things I ever did was move to Los Angeles from Hawaii at the age of 18. It was a huge step for me. I climbed Mt. Shasta. I didn’t think I could, but I did. I tried ziplining, which was pretty bold for me! I would say the boldest thing I have ever done was move across the country to go to college. The boldest thing that I have done is to leave my 9-5 job for a more fulfilling work-at-home job. The boldest thing I’ve ever done is hike the Grand Canyon rim-to-rim in one day! The boldest thing I ever did was sell programs at the state fair when I was in my 20s. I had to stand at a podium and call out a sales pitch loudly for 6 to 8 hours every day for over 2 weeks each summer. I am normally a quiet person, so it wasn’t an easy thing for me to do. I was the top seller by my 2nd year, and the commissions I made were great. The boldest thing I ever did was to get married very young, and then manage to stay married for the next 43 years. It’s been really hard at times, but now we’re both retired, and I think it’s been great that we did. Probably the boldest thing I’ve done – along with my bold husband – is to retire early and start enjoying life on a lot less money. The boldest thing I have ever done is compete a backhandspring on the beam in a gymnastics meet. The boldest thing I have done is give my honest opinion in class discussions when I knew it would hurt my grade! My tongue, that’s the “boldest” thing on me, very sharp and probably gonna get me fired from my job! The boldest thing I have ever done was drive alone from CA to WA when I was 20. The boldest action I have ever taken was to go on a cruise to Alaska six weeks after cancer surgery. I had never been on a cruise and didn’t know what to expect, but it was one of the best decisions I ever made. It got me back into life and forced me to move on. Four months after that, I went to Italy. When life throws you a bum curve, you have to learn to be bold very quickly. There are several bold things I have done. Probably the most daring was joining match.com which led me to finding my husband. Neither of us drinks coffee. I love the smell as it is brewing or even the newly opened can, but taste… nope, and even coffee flavored ice cream or brownies is does not work for me. The boldest thing I have done lately is drive in KC, MO and not get lost. Driving in a small town is a LOT different! The boldest thing I’ve done was the fly to the Philippines to meet a guy that I met off the internet and marry him less than two weeks later! Oh and adventually flying home pregnant having our daughter without him here to be reunited with him when she was 11 months old. Just celebrated our 13th anniversary in June. The boldest thing I’ve done was the fly to meet a guy that I met off the internet and marry him less than two weeks later! Oh and adventually flying home pregnant having our daughter without him here to be reunited with him when she was 11 months old. Just celebrated our 13th anniversary in June. the boldest thing I’ve done was back when i was in my mid 20’s. I quit my job and moved from mpls to chicago with my boyfriend(of 6 yrs), then broke up with him 5 mo later. Best and hardest decision ever! I felt bold last week when I drove us the 500+ miles home from Torrey, UT when my husband was ill.
One of the boldest things I have ever done is stand firm in my faith in Jesus Christ even though I knew I would lose friends. The boldest thing I have ever done was just recently. I adapted a vegan diet for life!!! I made a bold move divorcing at the age of 27 & choosing to support myself all these 30+ years without feeling I needed a partner (well, maybe occasionally). One of the boldest thing I have done is gone on vacation by myself. Another is I met a health issue head on (told I wasn’t going to walk again) I am walking and all sorts of stuff though there are still limitations. For the first time, I went shark fishing in the Atlantic ocean. That was bold for me! The boldest thing I have ever done was leave a great job and career opportunity to become a stay-at-home mom. Still loving that decision! The boldest thing I ever did was send a plane ticket to NY to a guy I had just met on a trip who was dating someone else. He broke up with her to date me. The boldest thing I’ve ever done is travel to Europe by myself for 8 weeks when I was 24! It was awesome! Mostly I’m pretty mild mannered, but put me on my racing bike (that’s a bicycle, not a motorcycle) and I am very bold. Always wear your helmet and make sure it is secured properly when you cycle! The boldest thing I ever did was to step forward and become the FIRST volunteer coordinator of parent volunteers at my son’s Catholic High School. And then I did it for 13 years with close to 10,000 hrs. The boldest thing I’ve done is giving up a career building job to move to a much better area of the country where jobs in the field are scarce. The boldest thing I ever did was move from the east coast to the west coast and leave my family and job. The boldest thing I ever did was hop on a plane to Europe for 3 weeks without knowing where I was going to stay or what I was going to do! The boldest thing I have done is skydiving.